I was feeling very creative yesterday! …and decided to layer two dresses for a playful look. I also tied the strings in the back of my neck instead of over my chest. What can I say…sometimes I wake up in the morning feeling like a little kid again; ready to venture out and try new things without fears. Well, yesterday was one of those days for me. I enjoyed my look with its details; mainly how my white dress peaked out a little bit at the bottom, which I think this is a very important detail to take into consideration when layering two dresses. I hope you are having an adventurous weekend. Me sentí muy creativa ayer!…y opté por ponerme dos vestidos al mismo tiempo como un estilo juguetón. También me decidí amarrar los cordones de mi vestido en la parte trasera de mi cuello en lugar de llevarlos en mi pecho. Qué puedo decir, a veces me despierto por la mañana sintiéndome como un niña otra vez; lista para aventurar con cosas nuevas sin temores. Bueno, ayer fue uno de esos días para mí. La verdad yo disfruté este conjunto y sus detalles y sobre todo cómo mi vestido blanco curioseaba un poco debajo del vestido rosado en la parte inferior. Yo creo que este es un detalle muy importante que hay que tener en cuenta cuando se llevan dos vestidos…el vestido que se lleva abajo debe ser un poco mas largo que el que llevamos encima. Espero que estén pasando un fin de semana lleno de aventuras. "An adventure is only an inconvinience rightly considered. An inconvenience is only an adventure wrongly considered." I want to thank Chimere Nicole for interview me and posting it in here blog. I also want to thank Bella from Citizen Rosebud blog for featuring me in her Rosebud of the week. 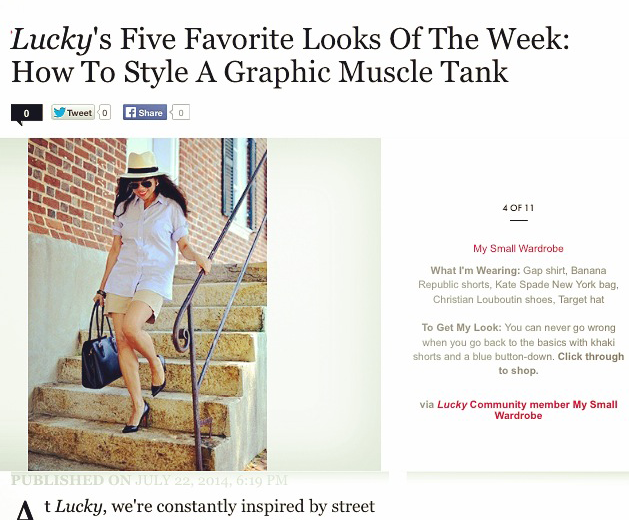 And last but not least, I want to thank Lucky Magazine for featuring again one of my looks in their website. White dress/Vestido blanco: Gap (last year). Pink dress/Vestido rosado: Donna Karan (old). Similar here. I love this look. I will have to try it myself sometime. It's definitely playful and I can see it going well with mixed prints too! I was thinking the same! Have fun Mariah creating your own look. Thanks!